Do you know what Census data is? 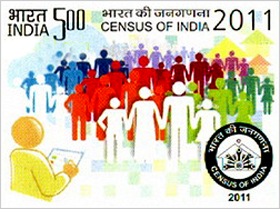 The Government of India declared the census data on the religious profile of India. People are talking about the religious census data and wondering what exactly it is! Here, we have explained everything about it. Have a look! The share of Hindu community in India’s total population has revealed a minor decline between the years 2001 and 2011. However, the Muslim Community has increased to some extent in the same period of time. Well, the Hindus now make up 79.8% of India with a minor decline of 0.7% points, while Muslims, the largest community make up 14.2% of India has increased 0.8% points. The Muslim community population has increased and their 10 years growth rate has shown a big decline. Moreover, the religion based data was all set to be announced in January 2014 however the UPA government decided not to publish it due to general elections that year. 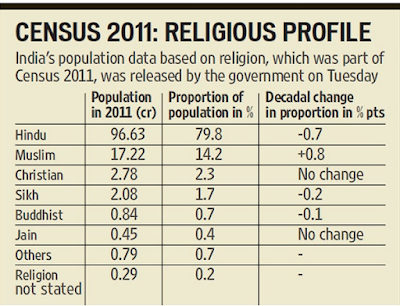 Moreover, the Data of 2011 Religious Census came in public after the approval of Home Minister Rajnath Singh. 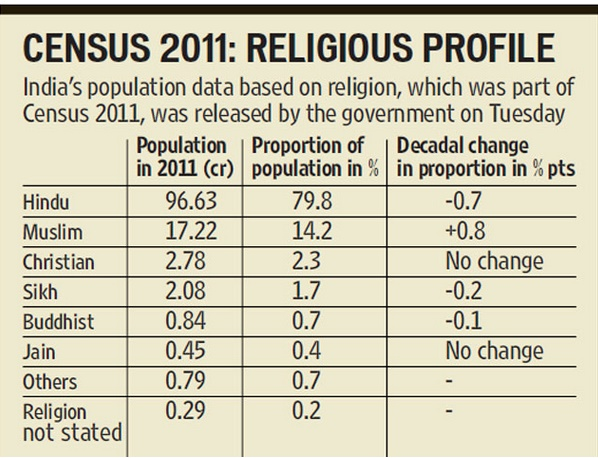 Here is the Data of 2011 Religious Census. As you can see in the table given above, India’s Hindu Population is 96.63 crores and Muslims are at 17.22 crores. Moreover, there are 2.78 crore Christians, 0.45 crore Jains, and 2.08 crore Sikhs in India. However, the share of Sikh community fell down by 0.2% points to 1.7% of the population in the 2001 to 2011. However, the Buddhists publicized a decline of 0.1% points to 0.7% of the population of India. Moreover, there were no important change in the population of Jains and Christians who make up 0.4% and 2.3% of the population correspondingly. However, the Muslims have previously observed a higher population growth rate than other major communities of India. Though, this rate of population has been on decline for the past three decades. In addition, the Muslim growth rate in the year 1991 census was 34.5% and it slowed down to 29.5% in the year 2001 and then increased to 24.6% in the year 2011. The Data of 2011 Religious Census released on Tuesday shows that the Assam and West Bengal has the highest increase in the Muslim Population during 2001 to 2011 years, a change which is connected to the illegal migration from Bangladesh. If you have any questions about Data of 2011 Religious Census the please ask us! Leave comment below to ask a question!